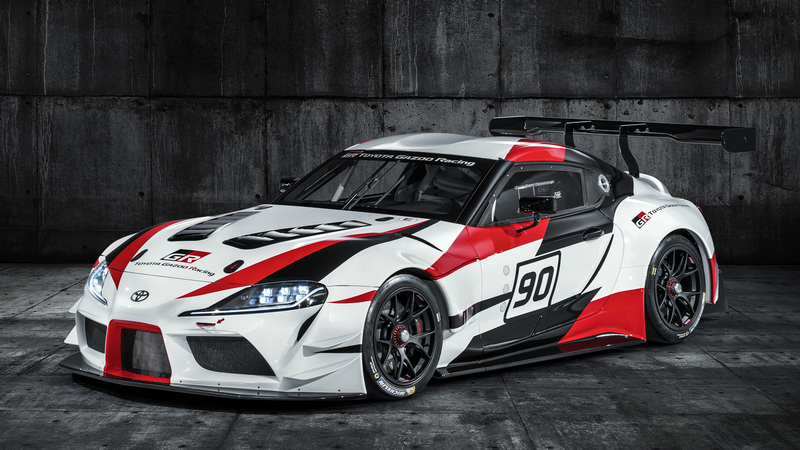 At the recent Geneva International Motor Show in Switzerland it was revealed that the Toyota GR Supra Racing Concept car will be added to GT Sport in April. Based on the sports car the company produced until 2002 the updated version has been created by Toyota Gazoo Racing, the division of Toyota that handles their motorsports activities. This traditional long nose – short deck form machine, is a front engine, rear wheel drive 2 door coupe. The compact body utilizes light weight high strength carbon composite materials implemented in front line racing. The large blister fenders and rear wing, as well as the rear diffuser, were developed to provide superior aerodynamic and driving performance. The suspension, wheels, tires, and brakes utilize pure race spec hardware. The interior contains a dashboard with a rear view monitor, racing seats, steering wheel with paddle shifters. The column, pedals, and roll cage are all complying with racing specifications too. Am I right in thinking Polyphony have the rights for Le Mans? If so we should be getting that track around June I reckon.